Jackrabbit Mountain is a relatively new trail system located along the shores and hills beside Lake Chatuge near Hayesville, NC. 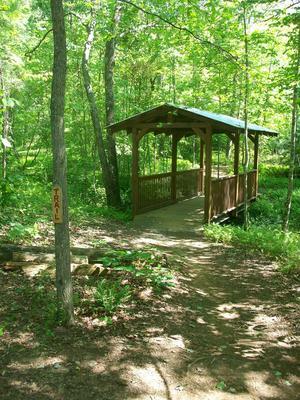 A unique covered bridge on the Sneaking Creek trail at Jackrabbit Mountain. On Saturday, April 30, 2011, a Grand Opening was held at the trailhead for the new trail system, which included speeches, a ribbon cutting, group hikes and mountain bike rides, barbeque, and great weather. This date officially marked the opening of the Jackrabbit Mountain trail system, which now provides access to over 14 miles of trails in the southern parts of Nantahala National Forest. All trails are open to mountain biking and hiking, and although the trails were constructed specifically with mountain biking in mind, they're a nice place to hike as well - and would be a no-brainer if you're staying at the nearby Jackrabbit Mountain campground. These trails were constructed over a period of over 5 years in a "Stacked Loop" configuration. A main central loop, which is easy and nearly level, has junctions with several more difficult side trails, traveling to some interesting destinations such as ridgetops and beaches. The forest here is mostly young, having been logged with a type of selective logging technique in the not-too-distant past. Stands of even-aged, smooth-trunked trees lie beneath a few leftover larger, shelter trees that were allowed to stand when the logging took place. There's quite a bit of poison ivy, so keep that in mind when choosing your clothing, especially during the summer. 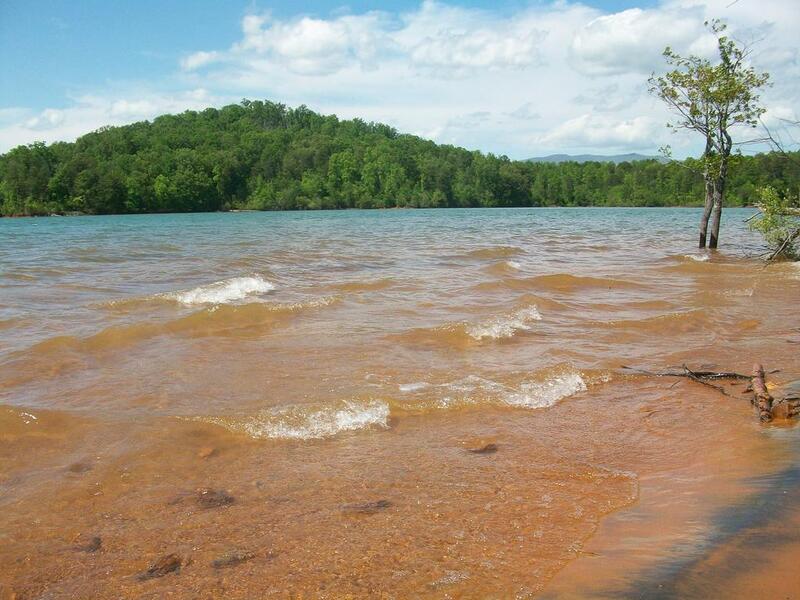 There are no major stream crossings to speak of, but the lake is always nearby for you to enjoy. Small picnic area at the Jackrabbit trailhead. Fuel up before or after your hike! 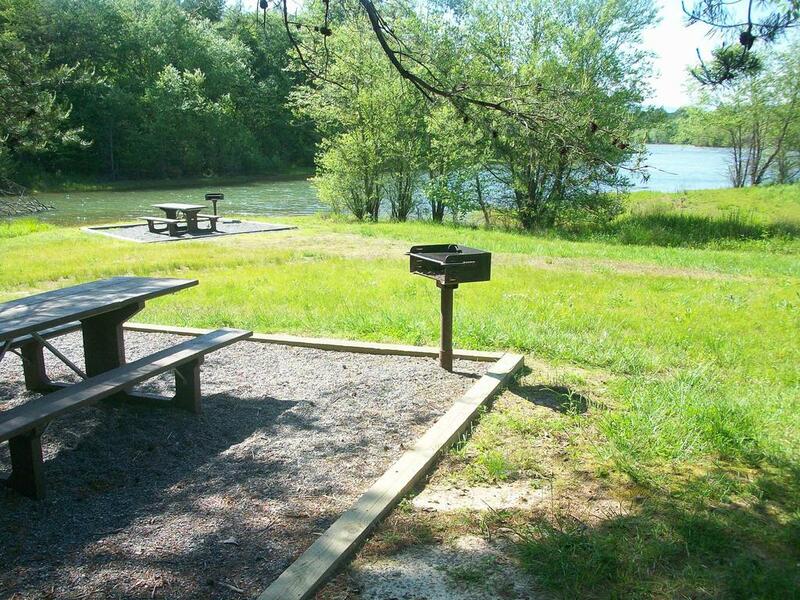 At the trailhead, there are plenty of parking spaces, pit toilets, maps & information, and a grassy field with picnic tables by an arm of the lake. Camping is available nearby in the Jackrabbit Mountain Campground, which is on the lake shore. A trail is planned to connect the trailhead with the campground, but for now, hikers can walk along the road to get there without driving. There are more hotels nearby in Hayesville and a bit further in Murphy (30 minutes).